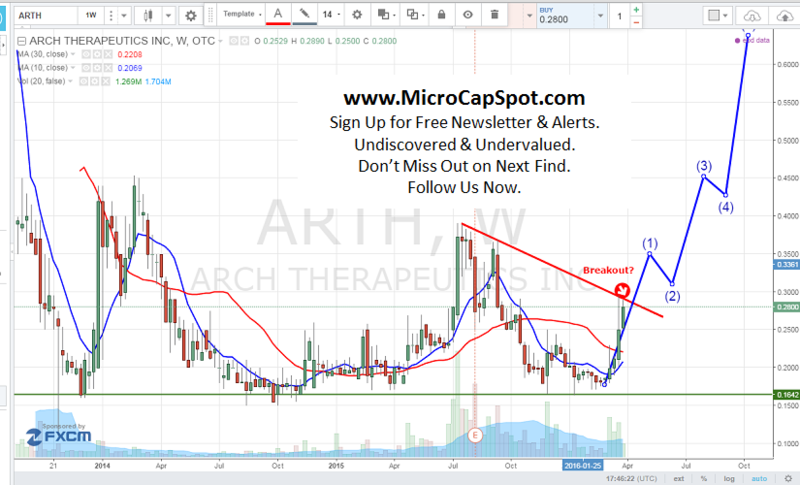 Arch Therapeutics Inc (OTCBB:ARTH) released and filed an 8-K form with the SEC announcing that it had announcing that the Company has received favorable results for its lead product candidate, the AC5 Surgical Hemostatic Device, in a skin irritation test. The study was a Cumulative Irritation Evaluation designed to determine the skin irritation potential of AC5 and controls. The product candidate AC5 was applied for 21 sequential days to the skin of a total of 41 healthy human subjects. The test subjects were both male and female. Results were obtained by evaluating and comparing the subject’s skin in areas where AC5 and the controls were repeatedly applied. Based upon the results, AC5 was not considered an irritant. In other recent developments, Arch Therapeutics Inc (OTCBB:ARTH) announced that it had began its patient enrollment for its first clinical study in Europe. This represents a major milestone for the company. The patients are actively being screened, enrolled, and treated or will be treated. The CEO stated that he was pleased with the progress thus far. The lead product that ARTH is attempted to monetize is AC5. It is designed to be a biocompatible synthetic peptide comprising naturally occurring amino acids. When applied to a wound, AC5 intercalates into the interstices of the connective tissue where it self-assembles into a physical, mechanical structure that provides a barrier to leaking substances, such as blood. AC5 is designed for direct application as a liquid, which we believe will make it user-friendly and able to conform to irregular wound geometry. Additionally, AC5 is not sticky or glue-like, which we believe will enhance its utility in the setting of minimally invasive and laparoscopic surgeries. Further, AC5 is transparent, which should make it easier for surgeons or other healthcare providers to maintain a clear field of vision during a surgical procedure and prophylactically stop bleeding as it starts, which we call Crystal Clear Surgery. ARTH is currently trading at a $35 million market valuation. The 52-week range is between $0.16 and $0.39. The stock has almost doubled since the prior month. There are over 109 million shares outstanding and daily average volume has exceeded 0.5 million shares. The stock currently trades at $0.30 and has gained over 7% during intraday trading. We will be updating on ARTH when more details emerge so make sure you are subscribed to Microcapspot so you know what’s going on with ARTH. Don’t Miss Next Alert. Subscribe Right Now! Disclosure: we hold no position in ARTH either long or short at the publication of this article.